Today, you can walk into a Portland bookstore and find dozens of hiking guides, most with a narrow geographic focus or hiking speciality — hiking Mount Hood, hiking with dogs, hiking with kids, day hikes, backpacking trips — that cater to every stripe of hiker. 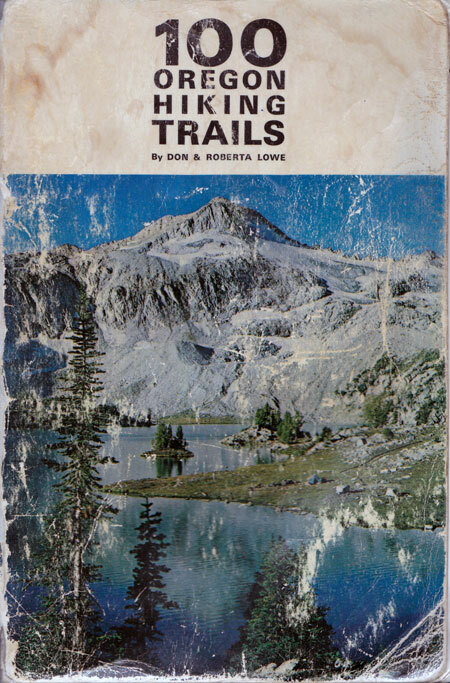 But in the beginning, there was only one guide: 100 Oregon Hiking Trails by Don and Roberta Lowe. 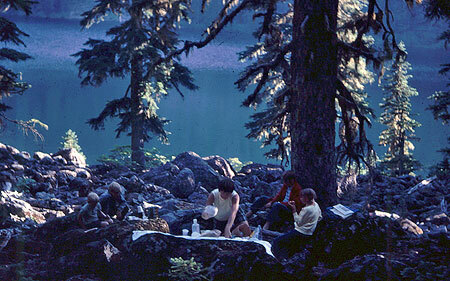 The book was published by the Touchstone Press in 1969, and was the first of many guides that established the Lowes as the undisputed experts on hiking in Oregon. 100 Oregon Hiking Trails set the bar for what every hiking guide is still judged by. The Lowes hiked every trail in the book to ground-truth and map actual trail locations, covering 1,400 miles in their efforts. Each hike includes Roberta Lowe’s detailed narrative describing the trip and a summary of basic trail data, including elevation gain and loss, mileage, hiking season and driving instructions. Don Lowe is an accomplished photographer, and captured photos for each hike. 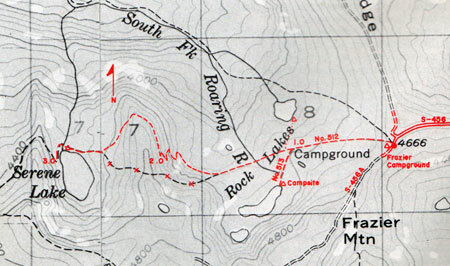 Don also created custom trail maps using USGS topo sheets as his base — and often correcting the actual trail location, adding trail highlights and mapping forest road updates. The result was a pioneering guide that many hikers carried in their packs (after all, this was the era when photocopiers were still rare!) and relied upon as their “eleventh essential”. Exactly half the trips in 100 Oregon Hiking Trails are day trips from Portland, and another thirty are in the Central Oregon Cascades. The twenty remaining trips are spread across southern and eastern Oregon. Most of these hikes are still classics, covered many times over in field guides published over four the decades since the Lowes first described them. 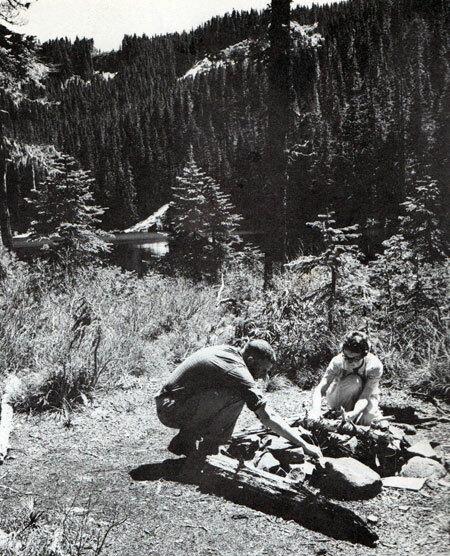 But while the destinations are the same, many trails have changed significantly since 100 Oregon Hiking Trails was published: most of the trails we know today on Dog Mountain and Silver Star Mountain today simply didn’t exist in 1969, for example. In a few cases, the destination itself has changed: former lookouts are gone (Silver Star Mountain, Saddle Mountain, Bald Butte), viewpoints partly grown over (Lost Lake Butte, Fish Creek Mountain) or trails simply lost (the Perdition Trail). Perhaps most importantly, 100 Oregon Hiking Trails was a hedge against the sharp decline in forest trails that accompanied the escalating timber harvests on federal lands in the 1950s and 60s. Though clear cuts and logging roads claimed many more trails during the logging heyday that continued through the 1980s, the Lowes inspired countless Oregonians to rediscover their forests. These new hikers, in turn, brought a new awareness of the heavy toll that industrial forestry was having on our public lands. 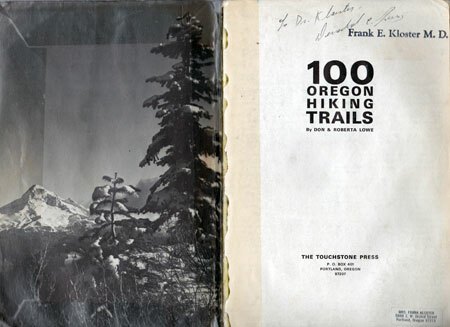 Like most outdoor-oriented Portlanders in the late 1960s and 70s, my family had a copy of 100 Oregon Hiking Trails out on the coffee table (right next to Ray Atkeson’s Oregon, Jack Grauer’s Mount Hood: A Complete History, Maynard Drawson’s Treasures of the Oregon Country, Ralph Friedman’s Oregon for the Curious… and a few recent issues of LIFE magazine). 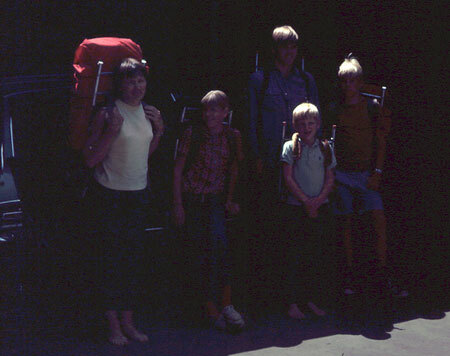 Ready for adventure: Mom, sister Carol and older brothers Kurt and Mark with yours truly getting ready to load up the station wagon. Dad is behind the camera, and oldest brother Pete off to college. 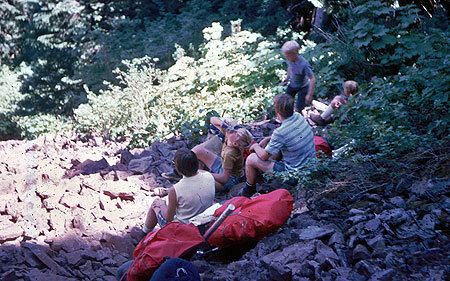 My earliest family day hikes in the Gorge and around Mount Hood were at the age of five or six. But after reaching the ripe old age of eight in 1970, my folks deemed me old enough to carry my own backpack. It was July, and the destination was Hike No. 43 in 100 Oregon Hiking Trails: Serene Lake. This trip still stands as my earliest hiking memory, and made me a hiker for life. The trip started from the Frazier Turnaround, reached by a primitive road that was just as rough in 1970 as it is today. Back then, my dad was navigating an aircraft carrier-like 1967 Plymouth Fury II station wagon over that road – a thought that seems terrifying today. I recall a lot of lurching and grinding through the boulders and dust-filled potholes that pass as “road” along this route… and some choice expletives from dad, of course! Once at the trailhead, we saddled up in packs ranging from cutting edge (my folks and older brothers had spiffy orange Kelty backpacks) to retro — my sister and I had military surplus canvas packs from Wigwam, a 60s-era army surplus store in Portland. Thankfully, our canvas packs had “modern” aluminum frames – an improvement over oak! The same held for our tents: my folks slept in dad’s orange, nylon climbing tent, while my older brothers carried two army surplus canvas pup tents for the kids. 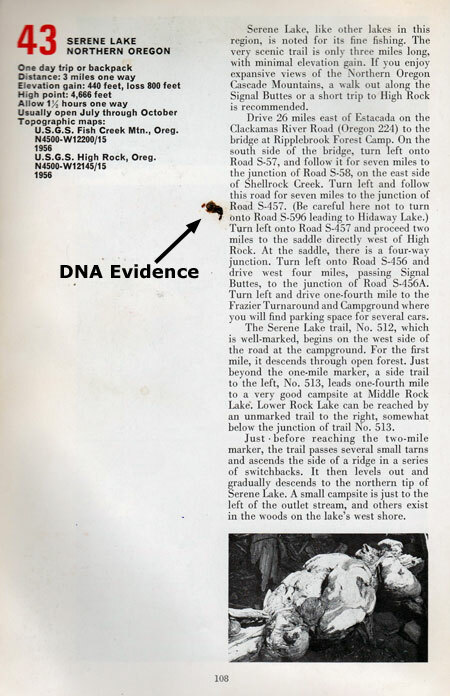 Dad reviewed the route in our copy of 100 Oregon Hiking Trails, then stowed the guide in the top pocket of his pack. The hike was uneventful, and soon we arrived at the north shore of Serene Lake, right where the Lowes are pictured in the guide. We had plenty of day left for exploring, a very quick (and cold) swim, wading in search of crayfish and a picnic on the talus slope above the lake. Finally, it was time to set up camp. We stayed on the west shore of the lake, where I’m fairly certain at least one rustic picnic table existed. The canvas pup tents came with heavy metal stakes, but no poles – we used sticks for that. They also had simple cotton ties for closures, a detail that would prove fateful as evening approached. Mom set up an impromptu picnic lunch on a talus slope above Serene Lake. As sundown approached, the infamous mosquitoes of the Rock Lakes Basin descended upon us with a vengeance. Dad sprayed the kids down with a can of OFF! bug spray, and built a campfire to make our dinner. The fire did a good job of keeping the bugs away, so we stayed up late, roasting hot dogs and marshmallows in the warm, bug free circle. Bedtime brought on a sequence of memorable events that are now family lore. I was paired with Kurt, my oldest brother on the trip, and our first unpleasant discovery was just how impossible it would be to keep mosquitoes out of that pup tent. More drama followed: at some point during the night, I woke my brother up to tell him I was about to throw up. Our recollections vary on what happened next, but I distinctly remember being ejected from the tent like a human missile, and spending the next 20 minutes (or was it hours?) hunched in a patch of huckleberries paying the price for all those hot dogs and marshmallows. At some point, I was allowed back in the tent, but only after losing another pint of blood to the mosquitos… and my dinner. A mummified mosquito is proof that dad opened up the guidebook at least once during our buggy stay at Serene Lake! Despite the long night at Serene Lake on that first backpack trip, I was hooked. After the hike, I pored over our beat-up copy of 100 Oregon Hiking Trails, memorizing it. Our family went on to hike many of the trails described in the book, and in later Lowe guides (that I also memorized). The die was cast, and I was addicted to hiking for life. These early experiences are why I LOVE to see parents with young kids out on the trail — they’re setting them on a very healthy, satisfying path… literally! An added bonus is that hikers are among the best forest stewards and conservationists, simply because they come to know the land on a very personal level. 100 Oregon Hiking Trails was only the beginning for Don and Roberta Lowe. Within a year of its publication in 1969, their second book, 100 Northern California Hiking Trails, was published in 1970. Many books followed over the next three decades. Each of the subsequent books is more focused in scope, including regional hiking guides for Oregon, Southwest Washington, Northern California and Colorado. 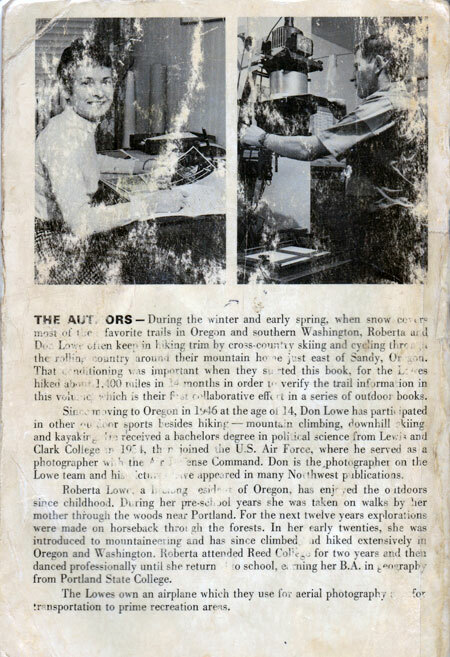 The Lowes also wrote one of the first mountain biking guides for Oregon, in 1991. The back cover of 100 Oregon Hiking Trails features the dynamic Lowe team at work. All of these books are worth collecting if you’re a hiker interested in trail history, or exploring those “lost trails” that have dropped off Forest Service maps and maintenance schedules, but can still be followed. A favorite among the later Lowe books is 50 Hiking Trails: Portland and Northwest Oregon, published in 1986. This classic is still sought after for its description of some of the most threatened, least traveled trails in our region, and has helped these trails survive by introducing new generations of hikers to them. 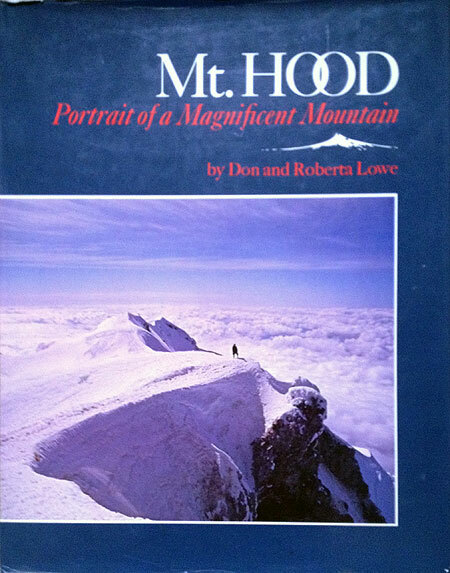 Perhaps the finest Lowe collectible is their beautiful large-format book Mount Hood: Portrait of a Magnificent Mountain, published in 1975. Though Don Lowe’s photographic talent is evident in the small, black and white images that fill the many Lowe guidebooks, the beautiful collection of Don’s fine color photography in this book is simply stunning. Likewise, Roberta Lowe has the space in this book to expand her prose to a compelling story of Mount Hood’s natural and cultural history. This is a must-have for Mount Hood lovers, and can still be found at local bookstores. Postscript: this is the 100th article posted on the WyEast Blog since starting it nearly four years ago, so celebrating 100 Oregon Hiking Trails seemed like the perfect topic! The books of Don and Roberta Lowe had a big impact on my life, and I’m sure many others were influenced by their celebration of Oregon’s wild beauty. In the early 1980s, I approached Don and Roberta Lowe for help with a college project: creating a trail map of the (then) embattled Salmon-Huckleberry backcountry as part of the campaign to preserve the area as wilderness (which eventually happened in 1984). The Lowes invited me to their home to discuss the project, and patiently endured my endless questions. Don even gave me a tour of his basement darkroom, where all those maps and images I had memorized had been created. Roberta kept up a correspondence on my student project for over a year, and I still keep those old letters as a reminder of their generosity in helping a young student with their time and knowledge. I ran into the Lowes again about a year ago, and in catching up with them, was reminded once again what a gift they were to Oregon. They were an important part of that special Oregon spirit of the 60s and 70s that still defines what it means to live here today.